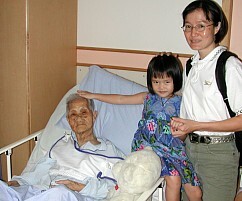 My beloved Great Granny had a fall on Christmas Eve night, 24 Dec 2002, and sustained a hip fracture. 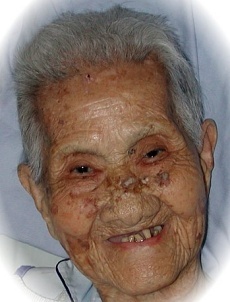 She underwent an operation in Gleneagle Hospital by Dr Liang and was subsequently admitted to Westpoint Hospital for rehab. Unfortunately, bed-ridden Great Granny suffered secondary infections (pneumonia and urinary tract infections) and passed away peacefully on 19 Jan 2003 at 4.52pm, at the age of 97. We all love you dearly, Great Granny. You shall live on in our heart and memory. Visiting Great Granny at Westpoint Hospital. 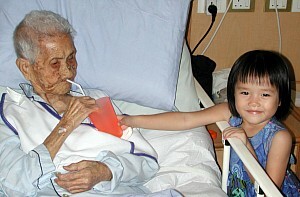 Robyn loves to take care of Great Granny. 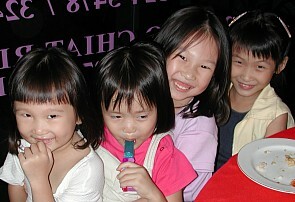 It's the time of the year to volunteer our service to help do spring cleaning for the old folks at Kim Tian Road, organised by the Singapore Adventurers' Club. This year, I helped to wash toilet! 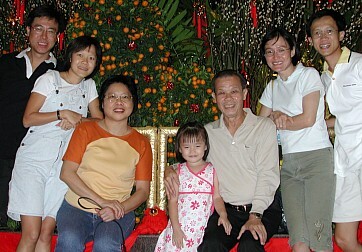 Send-off party for Grandpa and Grandma, who were bound for China for Uncle Melvin's wedding.